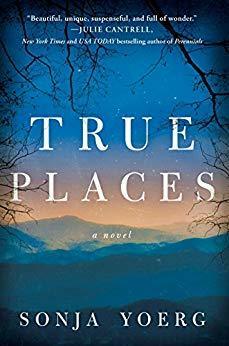 I have a huge stack of books to read but when I received a copy of True Places, it went right to the top. I have read all of Sonja's books and knew that it needed to be read NOW. WOW - what a fantastic book - I wish I could give it more than 5 stars. I know that it's early in 2019 but True Places will definitely be one of my top books of the year. The writing is so beautiful that I had to stop several times to re-read and I became part of the story instead of just the reader. Suzanne is a wife and mother who has overscheduled her life to take care of her family and lost her own dreams in the harried life that she lives. Not only is she busy taking care of everyone else but her kids are teenagers now - the son kind of a strange quiet boy and the daughter who at 15 takes out all of her problems with life on her mother. She is just nasty to her mother and has no appreciation for her mother as anything but a mother - not as a woman who is trying hard to make life pleasant for her family. Her husband is little to no help - he is too busy making money to get involved in much at home. So here we have a family that looks perfect from the outside but is in the process of imploding. When Suzanne brings Iris, a homeless girl who has been living on her own in the mountains into their lives, things take a turn for the worse within the family. All of the characters were so well written that I felt like I knew them. Suzanne was such a fantastic person, realizing that she had lost herself in her busy life but having no idea how to make changes that would make her the person that she used to be who had dreams and plans for her future. It's only when Iris is brought into the home that Suzanne begins to see her life for what it is -- a hamster wheel where she spends all of her time taking care of other people and no one takes care of her or even acknowledges what she does to make their lives easier. Through Iris, she realizes that she has lost touch with nature and solitude and taking care of herself. Will she be able to step out of the whirlwind of her life to find the peace and dreams that she needs to be happy? Will her family learn from her changes? Along with the wonderful characters, this novel has the beautiful scenery of the Blue Ridge mountains. Sonja describes the mountains so beautifully that I felt like I was in the woods with peace and quietness around me. This is an exquisitely written wonderful novel about family and love and following your dreams. It really is a must read for everyone! It's a book that I won't soon forget.